In a country as highly visited as Vietnam, You’d be forgiven for assuming that every locale worth exploring has been duly trampled by the masses. Thuan An Beach proves otherwise with a vibrant new Resort located eastern of Hue City (Vietnam’s historical city of Hue) on picturesque Tam Giang Lagoon in Thua Thien Hue Province, Just a few steps from Thuan An Beach. After a day’s adventures exploring tombs, pagodas... of Vietnam’s historical city of Hue return to the relaxed seclusion of Tam Giang Resort. Stylish in design the resort blends modern concepts with a traditional Vietnamese themes and colors, providing you with a true sense of Vietnamese culture and lifestyle. 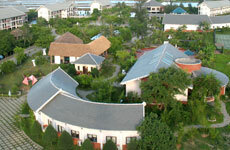 Its design brings the Resort to life with flowering garden ,environmentally – sensitive landscaping and Romantic lagoon, indoor ”mineral Spring water” pool, food and beverage options and some much-needed pampering, herbal treatments, aromatic oils and massage at the renowned Tam Giang Spa. Behind the lobby & garden, Lagoon Bar with hidden charm and wild. This is a perfect space for you beloved to sip some drink and rest and talk. You will never forget these meaningful moments. Country music gives you an excellent space. With buffet station in the centre and spacious indoor & outdoor areas, the restaurant server daily American and Continental breakfast, international lunch and dinner. For Vietnamese food, you could also enjoy specialties of three regions of Vietnam. One private room is exclusively reserved for close meeting or intimate conversations. For dinners who love a romantic and gentle atmosphere, the outdoor garden is fascinating choice.